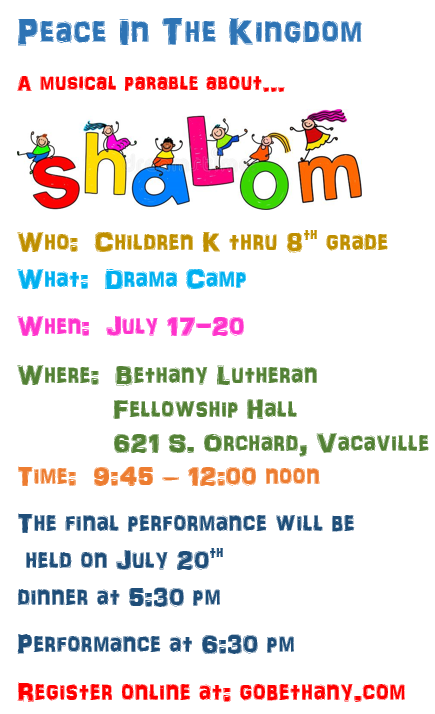 Peace In The Kingdom: Drama Camp! 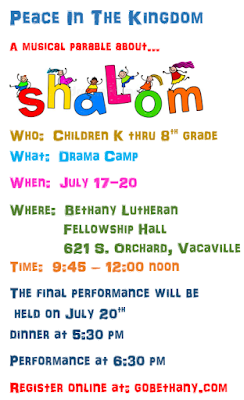 July 17-20, LWML is sponsoring “Peace in the Kingdom.” This is a musical parable about shalom. We need volunteers to help and we need children to attend. This is a four-day program, which will include a closing program, beginning at 5:30 pm, on the 20th (dinner included.) Registration forms can be completed on our website: gobethany.com or contact Carole Wilson at thewilsons1976@gmail.com. WE BELIEVE…that our program should meet the needs of the whole child (spiritual, physical, emotional, social, creative and cognitive) in a safe, nurturing positive environment. …that a child learns best by having opportunities to explore, create, and discover; so we maintain a child-oriented classroom, keeping an appropriate balance between child-initiated and teacher-directed activities. 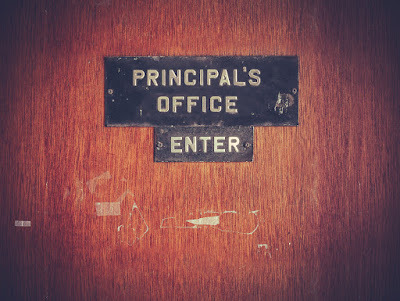 …and that the learning environment should foster a positive self-concept in each child, and that our staff should be sensitive to the individual differences and developmental stages of each child. Growing in understanding of God and His loving care. Developing a positive self-concept; thinking as an individual; expanding perspective. Developing social skills to include the communication skills needed to solve problems peacefully; working and cooperating together in small and large groups; respecting the property of others; helping, sharing and caring for others. 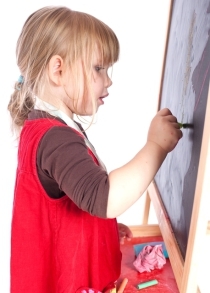 Encouraging children to think, reason, question, and experiment; developing language and early literacy skills, to include letter recognition, letter-sound correspondences, concepts of print, early writing skills, and oral and listening skills; developing number sense and mathematical reasoning skills. Developing awareness of beauty and appreciation of aesthetic experiences, including art, music, poems and books. Experiencing the artistic process. Participating through play, singing, creative experiences, rhythmic activities and dramatic play. Promoting physical development and well being; to include activities geared to develop large and small muscle coordination, and activities designed to foster good habits of health and safety. Respecting cultural diversity, to include books, pictures, foods, props, visitors, and cultural resources available in the community. Keep your students water safe! 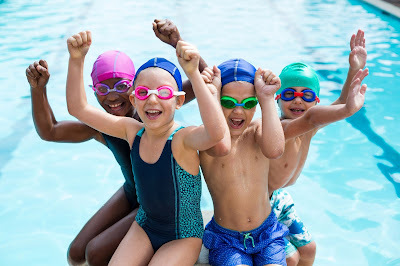 Health Spring Fitness Center is offering swim instruction this summer for ages and swim levels. Brochures about the course offerings are located in the information rack outside of the school office. Contact John or Mike at Health Spring Fitness Center to sign up. Mention Bethany Lutheran School and receive a 10% discount. Challenge yourself to READ this summer with Reading by Design sponsored by Solano County Library. Reading by Design runs from June 1—August 31, 2017. Everyone’s Invited—The challenge is for ALL ages. It’s Easy—Just ready what you want, log it, and earn prizes and rewards. There’s Help—Weekly events like concerts, magic shows, bubble blowing, are offered to entice you to keep going to the library. There are Prizes!—In addition to the prized you can win for reading the books you love, there are special drawings and games to help you stay in the reading groove. Get Started! Sign up online at solanolibrary.com/challenge or drop in at one of the libraries for logs and instructions. Our Summer Program Started Today! Summer Program began on Monday June 12th, 2017. Well, it pretty much (finally) feels like summer out there, and it looks like it, too! Every year around this time we get geared up for the warn weather, family outings, and long overdue rest and relaxation during the long days of summer. Now that school is out, more time can be spent getting know that pre-teen or teen wandering around the house in anonymity. Here are so fun activities that can completed with minimal efforts, but big results. Visit your local forestation. Most local stations will arrange tours for kids. This is an exciting field trip for preschoolers (especially those who love playing with toy trucks) and school-age children alike. They'll love checking out the different fire trucks and meeting real live firefighters. Root for the home team. You don't have to have season tickets to get into local sporting events such as a minor-league baseball game or a local swim meet. Play capture the flag. You'll need six or more people and two pieces of fabric of different colors, cut into flags (one for each player). Using flour for the outline, divide your yard into two adjoining courts about 12" x 12" each. Divide into two teams; each person places a flag on the back line of his court. Starting from their flag line, players dash to the opposite side of the field and try to pick up a flag from the other team. If a player is tagged, he's out and must stand behind the opposing team's line of flags. If he captures a flag, he's safe and can return to his court. The team that captures all of the opposing side's flags first wins. Check out the stars, the one’s in the sky. Buy a star chart to get started. Then choose one spot in your yard that affords a clear view of the heavens, and venture out after dinner to watch how the night sky changes hour to hour and day to day. A little fresh air before bedtime can really help your kids sleep later too. These are just a few ways to have some fun over the summer months. The main purpose of each of these activities is not just in having fun, but to spend time with one another. Although these are fun activities, the focus should be on family and enjoying each other. The bible reminds us in Ephesians 6:1-3 “Children, obey your parents in the Lord, for this is right. “Honor your father and mother” (this is the first commandment with a promise), “that it may go well with you and that you may live long in the land.” This passage helps me understand relationships within the family, and the importance of establishing those meaningful bonds over the course of ones’ lifetime. So, this summer, spend time getting to know one another again. Chat with each other, love on one another, and be a family in every sense of the word. Ask silly questions, talk about family history and share time as family in prayer. Jesus said, “Again I say unto you, that if two of you shall agree on earth as touching anything that they shall ask, it shall be done for them of my Father which is in heaven,” Mathew 18:19. By spending time in prayer you keep the lines of communication open between your family and the Lord, as well as those within the home. My prayer is that you all have a fantastic summer and that you are blessed beyond your dreams. Bethany Lutheran Church Parking Lot Sale! A great way to give and receive! HERE IS SOME IMPORTANT INFORMATION THAT YOU NEED TO KNOW FOR NEXT WEEK! 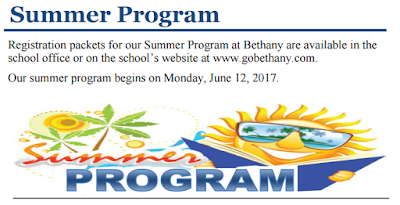 We welcome and encourage all of our Bethany families to attend both the 8th grade and Kindergarten celebrations of accomplishments. It took all of us to get them to this point; let us send them out peacefully with God’s care and love! Wednesday, June 7 and Thursday, June 8 are MINIMUM DAYS. All students will be dismissed at 12:00 noon. Yearbooks — Monday, June 5 — Yearbooks have arrived and we will be distributed to students by their teachers on Monday. Awards Ceremony—Wednesday, June 7—This year’s awards ceremony will be held on Wednesday beginning at 9:00 AM at the Ulatis Community Center (across the street from BLS). Parents are welcome and encouraged to attend. 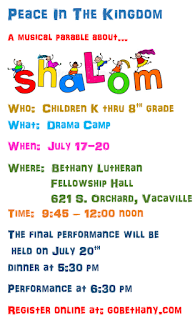 Kindergarten Celebration—Tuesday, June 6— Our Kindergarteners will participate in a promotion celebration to the 1st grade on Tuesday, June 6 at 6:30 PM at Bethany Lutheran Church, 621 S. Orchard Avenue, Vacaville. The Kindergarten class has been working very hard on their songs to present to parents, family and friends. Come celebrate their year with us! 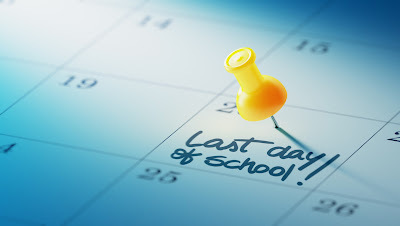 Eighth Grade Graduation—Wednesday, June 7— This year we will celebrate the tenth graduating class from Bethany Lutheran School on Wednesday, June 7 at 6:30 PM at Bethany Lutheran Church. All are invited. In keeping with tradition, this year’s graduating students have been working on their own graduation service. Year End BBQ & Field Day—Thursday, June 8—We will again have our Field Day festivities along with a delicious barbecue. We are looking for volunteers to step forward to coordinate the shopping, cooking and meal portion of this event. Field activities are expected to begin around 9:00 AM. Parent help will also be needed to facilitate the games. 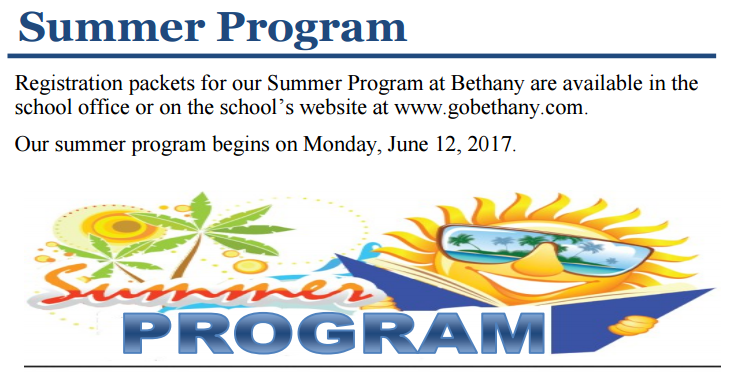 If you are able to help, please the school office at myschool@gobethany.com. This is a great way to finish up those Partnership Hours as this is the last opportunity for this year. Each student is asked to contribute to our meal. A separate flyer was sent home with students and is also attached with this edition of The Eagle. It gives more information and details about each class’s contribution. Parent help is also needed the day of the event with set-up, cooking, clean-up, etc. If you are able to help, please contact the school office. Students should dress in “school appropriate” clothing for Thursday’s activities. Weather on Thursday is expected to be very warm, so please make sure your student also brings and uses sunscreen. The festivities will last until 12:00 PM. 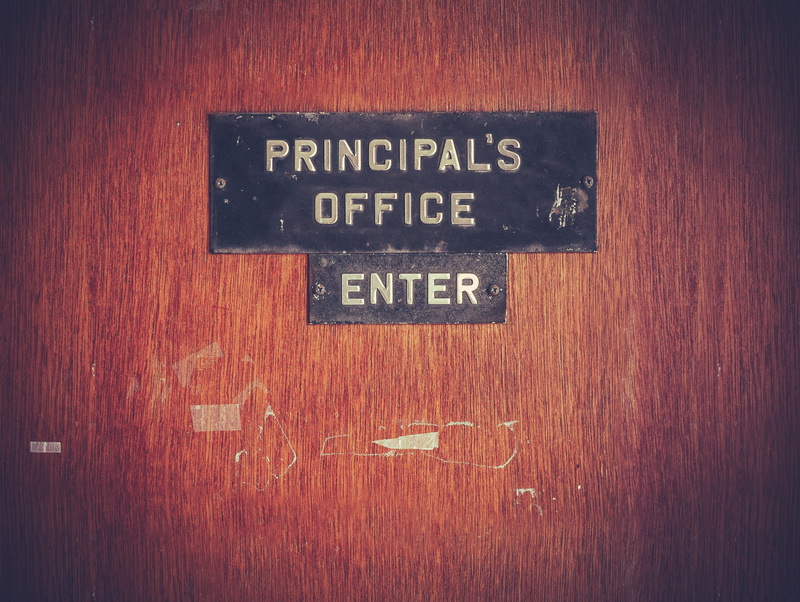 ALL STUDENTS WILL BE DISMISSED AT 12:00 noon. Extended care is open until 6:00 PM. For those families not enrolled in the extended care program, the cost is $8 per hour.